Selfies are huge on social networking sites. The word selfie was declared by none other than the highly respected Oxford Dictionary as the word of the year for 2013. For those of you who don’t know what a selfie is (there are some people who don’t), it is, according the Oxford Dictionary, “a photograph that one has taken of oneself, typically one taken with a smartphone or webcam and uploaded to a social media website.” There are even selfie derivatives now with my favorite being a belfie or an image of your posterior. 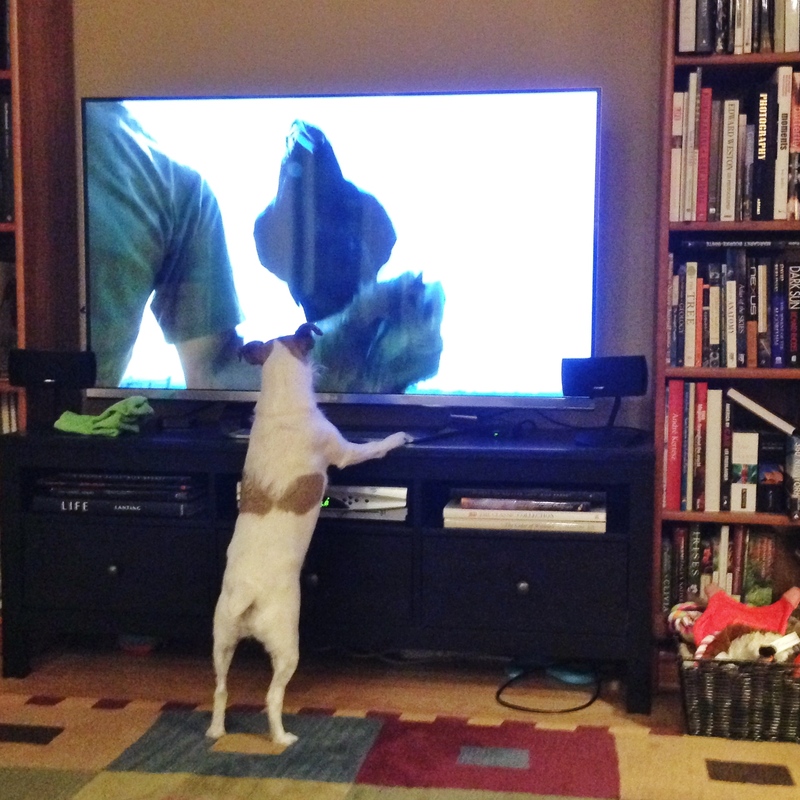 Dingo watching an episode of NOVA’s Inside Animal Minds, a series about the science of animal cognition and how it is changing what we know about the intelligence of animals. Check your local PBS station for dates and times. I think that a large percentage of the selfies I see are, to be totally frank, self-indulgent and egotistical exercises of the photograph art. I really don’t care to see you eating dinner or dressed in a cheerleader outfit or diaper or sitting on your toilet. (Yes, they are out there.) However, I can’t say that I have never shot a selfie. I do so very occasionally to document a moment but even then I don’t post it on Facebook. Despite my general feelings about selfies, I have decided today to make one exception to my general rule of no selfies: Dingo can make selfies. Dingo is my above average dog and she watches NOVA (see the image with this post for proof) and Nature on PBS, Ceasar Millan on Animal Planet, and any animal show on the National Geographic Channel. No cartoons for Dingo. She can also convince any of my office colleagues to part with their lunches with just a look. Over the next few weeks, I am going to train Dingo to take selfies for two reasons: (1) she needs to learn some tricks and (2) I get to spend quality time wither her sharing my love of photography. (It has been difficult to train her to use Photoshop or Lightroom because, without opposable thumbs, she has trouble using a mouse.) Dingo can be stubborn but responds well to food. So, she should learn quickly following the training outlined in this Photojojo article; it is based on the use of positive reinforcement, i.e., use food to incentivize the dog to take its picture. I also need to buy a new app, Big Camera Button, for my iPhone. 10 Apr	This entry was written by School of Creative Photography and published on April 10, 2014 at 2:20 pm. It’s filed under Inspiration and tagged dog, iPad, iPhone, iPhoneography, selfie. Bookmark the permalink. Follow any comments here with the RSS feed for this post.